Militia fighters attack the airbase used by military strongman Khalifa Haftar's self-proclaimed Libyan National Army (LNA). Members of the Third Force militia loyal to the UN-backed Government of National Accord in Tripoli on Thursday attacked the base used by Haftar's self-proclaimed Libyan National Army (LNA), military sources said earlier. "I am outraged by reports of significant numbers of fatalities, including civilians and by reports that summary executions may have taken place," UN envoy Martin Kobler said in a statement. Britain's ambassador to LIbya, Peter Millett, also denounced the assault. "Disgusted by attack on Brak al-Shati & reports of mass executions. Perpetrators must be brought to justice," he wrote on Twitter. The incident at the base in Wadi al-Shati district comes a month after an attack by the LNA on the Tamenhant airbase controlled by the Third Force near the south's main city of Sebha. The speaker of the eastern-based parliament, which is supported by the LNA, accused the Misrata-based Third Force of a "serious breach of the truce agreement reached in Abu Dhabi". Aguila Saleh said there were a "number of martyrs" in LNA ranks, without giving a figure. The speaker said he had given orders for the armed forces "to take the measures necessary to respond to the assault and defend the south and cleanse it of all outlaw militias". "We hope reason will prevail and that the escalation and provocation will stop," it said. 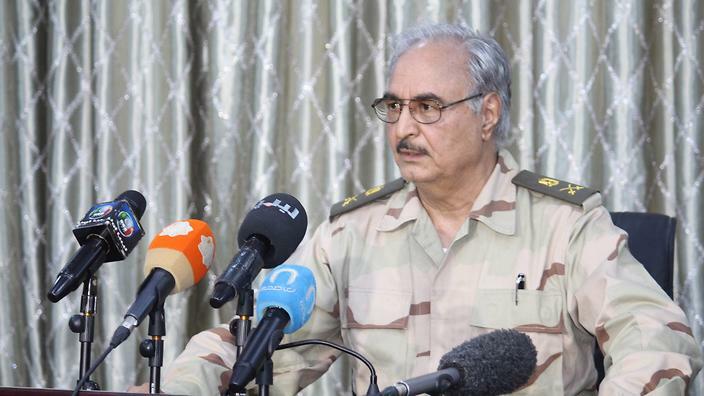 The unity government's defence ministry laid the blame on "those who started bombing Tamenhant base with warplanes and tanks", referring to Haftar's forces.In new violence on Friday, a pro-Haftar tribal chief, Sheikh Ibrayek Alwati, and five other people including a child were killed in a car bombing outside a mosque in the eastern city of Slouq, medical and security sources said.